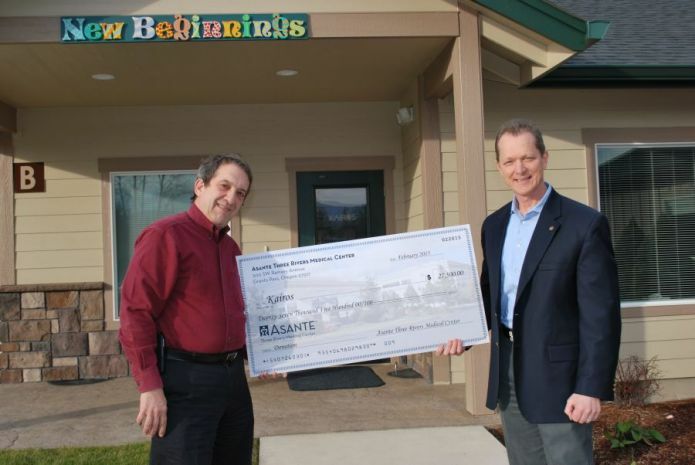 Asante Three Rivers Medical Center recently provided a donation to Kairos that will enable the organization to bring in a total of $475,000 in challenge grants from three foundations to support the development of its Children’s Mental Health Campus in Grants Pass. Kairos has been conducting a capital campaign to help fund the construction of the campus on Nebraska Avenue in Grants Pass. The campus is largely complete, with final adjustments and modifications being made to its buildings. It consists of a Community Services Building and a Psychiatric Residential Treatment Facility that also houses a Crisis Unit for young people in the Rogue Valley, and beyond, who are experiencing severe mental and behavioral emergencies. The new campus will expand the number of youth and families served by Kairos and provide a unique resource for emergency response for youth in psychiatric crisis. The campaign was supported by large grants from statewide and regional foundations as well as extensive local support. The Meyer Memorial Trust challenged Kairos to raise $250,000 locally in order to earn the final $100,000 of its $350,000 award. The M.J. Murdock Charitable Trust and The Ford Family Foundation both committed all or parts of their grants ($250,000 and $275,000 respectively) contingent on the local support. Kairos has had a robust response to the campaign. The Asante donation for $27,500 joins donations from AllCare, CareOregon/Jackson Care Connect, local businesses, and many individuals, enabling the organization to achieve the $250,000 challenge. The Asante gift topped off the challenge. Kairos is a children’s mental health agency providing a range of intensive psychiatric and community based services to young people age 14 to 24 and their families. Formally known as Southern Oregon Adolescent Study and Treatment Center (SOASTC), Kairos was founded by a group of community citizens in Grants Pass in 1977. It is now operating out of 14 locations in four counties, serving hundreds of young people and families annually. It also has a school based mental wellness promotion program serving Three Rivers School District, Grants Pass District 7, and Rogue River School District. “We are very excited at having reached this challenge and very appreciative to Asante for giving us the final push. We are also appreciative of the health care community in southern Oregon, which has supported this innovative development that will help young people experiencing severe mental and behavioral challenges have access to high quality attuned support and services,” said Robert Lieberman, CEO of Kairos. The Capital Campaign is not yet complete. Kairos’ Board has set a goal of $2.5 million. The organization has had extensive foundation, out-of-area philanthropy, and in-kind support in addition to the local fundraising and it is approximately $50,000 shy of that goal. It is planning a special Moments of Hope project to solicit the final community support to reach the campaign goal. Asante is a local, nationally recognized not-for-profit health-care organization providing more than $73 million annually in charitable care and community health benefits. Its three hospitals and physician group serves nine counties throughout Southern Oregon and Northern California. For more information contact Mary Lynne DeRocher at 541-956-4943, ext. 1116 or mlderocher@kairosnw.org.